Begin in an upright standing position. 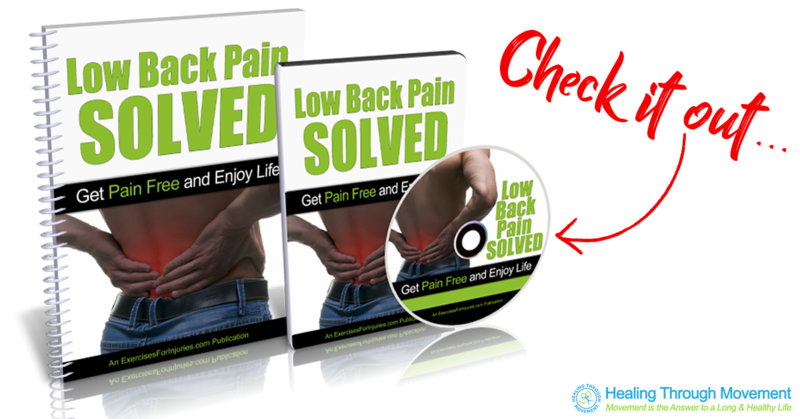 Place your hands on your lower back or upper pelvis area. Bring your hips forward then bring your head back and arch through your lower back. Return back to the starting position and repeat the movement. Start off with 1 set of 5 repetitions on each side. Perform the exercise in a smooth controlled movement with a good stop at the end position. The intensity of this exercise is light. The purpose of this exercise is to work on improving mobility and movement in the low back or lumbar spine. Begin in an upright sitting position on a chair, maintaining good alignment with your head, shoulders, and hips. Place your hands to the side at head level. Bring your shoulders back and arch through the mid-back area. Hold the position for 2 seconds. Return to the starting position and repeat the movement. Start off with 1 set of 5 repetitions, ideally holding for 2 seconds. Perform the exercise in a smooth controlled movement with a good stop at the end position. The intensity of this exercise is light. 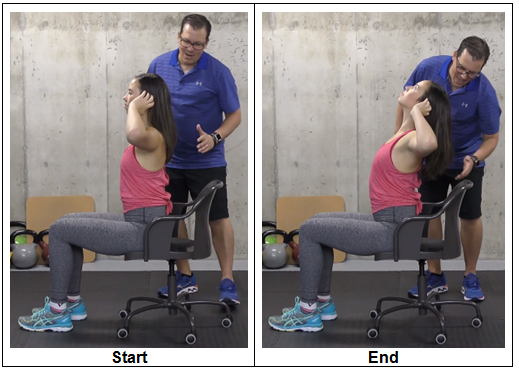 The purpose of this exercise is to work on improving mobility in the thoracic spine. Begin in an upright sitting position on a chair, maintaining good alignment with your head, shoulders, and hips. Cross one leg over the opposite knee. Slowly bend through the hips and bring your upper body forward. Hold the position for 10 seconds. Return to the starting position and repeat the movement on the opposite leg. Start off with 1 set of 2 repetitions on each side, ideally holding for 10 seconds. Perform the exercise in a smooth controlled movement with a good hold at the end position. The intensity of this exercise is light. The purpose of this exercise is to stretch out those deep rotators of the hip. Begin in an upright sitting position on a chair, maintaining good alignment with your head, shoulders, and hips. Bring one knee up and towards the opposite shoulder. Hold the position for 10 seconds. Lower your leg back down to return to the starting position and repeat the movement on the opposite leg. Start off with 1 set of 2 repetitions on each side, ideally holding for 10 seconds. Perform the exercise in a smooth controlled movement with a good hold at the end position. The intensity of this exercise is light. The purpose of this exercise is to stretch out the muscle deep in the hip. 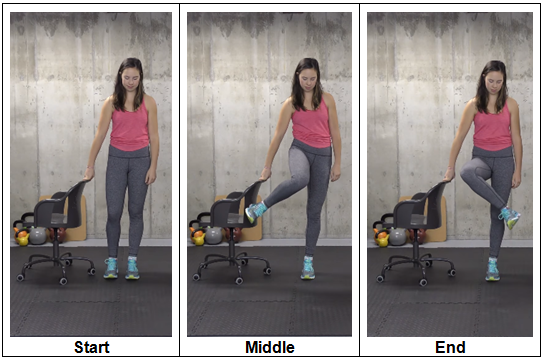 For this exercise, you can use a wall or the back of the chair or anything stable for support and balance. Begin in an upright standing position keeping your head, shoulders, hips, and legs in a straight line. Place one hand on the back of the chair for balance. Bring one knee up, ideally to about 90 degrees, then bring the heel in and out. Return to the starting position and repeat the movement on the opposite leg. Start off with 1 set of 5 repetitions on each side. Perform the exercise in a smooth controlled movement with a quick stop at the end position. The intensity of this exercise is light. The purpose of this exercise is to dynamically stretch the internal and external rotators of the hip.